With increasing privacy awareness and demand for security monitoring, IP surveillance has been widely used in the current society: in public supermarket, hotel, enterprise and even home. PoE network switch is used to provide both power and data connection to IP cameras in surveillance system. For small and medium-sized business or home application, 8 port PoE switch is a good choice. Figure 1: Using FS 8 port PoE switch for IP surveillance. Why Use 8 Port PoE Switch for IP Surveillance? Usually, 8 port PoE switch is used for supply power to powered devices (PD) for placing flexibility, including IP phones, IP phones and wireless access points (WAP). Some vendors like FS provide 8 port PoE switch with high resistance to electromagnetic interference and severe environment adaptability. This guarantee the smooth operation of weather-proof IP cameras and the stability of the whole IP surveillance system. Moreover, with all IP surveillance components centralized together with PoE switch, it is more convenient for management and control. 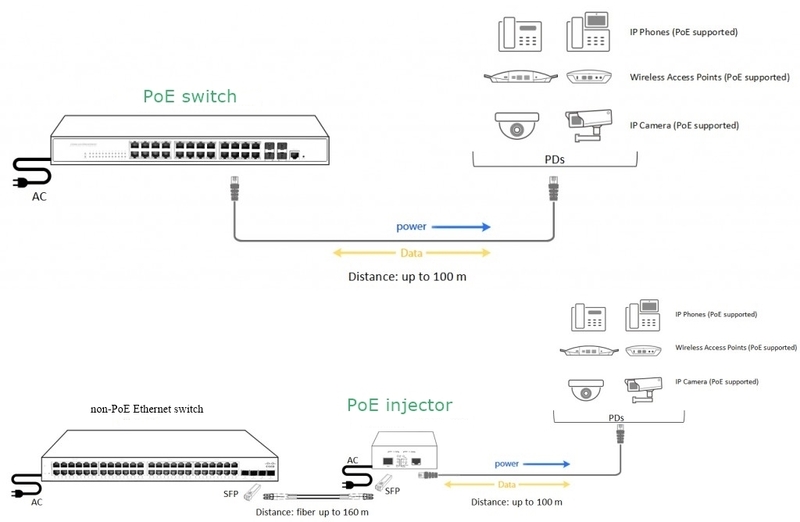 What Are the Considerations for Choosing 8 Port PoE Switch? For an IP surveillance system with very few IP cameras, one can simply add a PoE injector (midspan) between the non-PoE Ethernet switch and IP cameras. This is a cost-effective solution for elementary IP surveillance system because an 8 port PoE switch is usually more expensive than a PoE injector. However, what about more than 4 IP connections are required? In this case, PoE switch 8 port is absolutely a better way to go. Here are some considerations one should refer to while selecting a proper 8 port PoE switch for IP surveillance. Knowing the power consumption of each IP camera helps to choose an 8 port PoE switch with corresponding per port power consumption and the total power budget. The power consumption of PoE IP cameras can reach up to 20W (PTZ IP cameras RLC-423), and be as low as 3 or 4W. Just remember that your 8 port PoE switch should be able to provide power for each IP camera and won’t exceed its total power budget. There are two PoE standards: IEEE802.3af and IEEE802.3at. IEEE802.3af PoE standard can deliver 15.4W maximum power on each port of the switch, and 12.95W power available at PDs. IEEE802.3at is a PoE+ standard with 30W per port and 25.5W available for transmission. 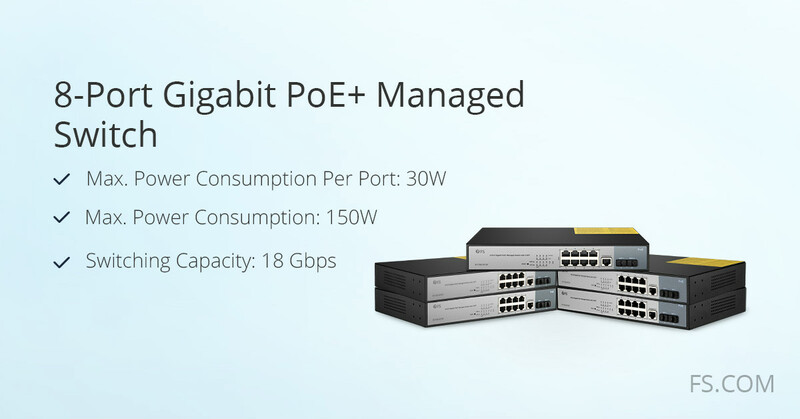 Each PoE switch has power consumption specifications for per port and as a whole. For example, FS S1130-8T2F 8 port PoE switch complies with both IEEE802.3af and IEEE802.3at. Per port maximum power consumption is 30W and total budget of the PoE switch is 130W. 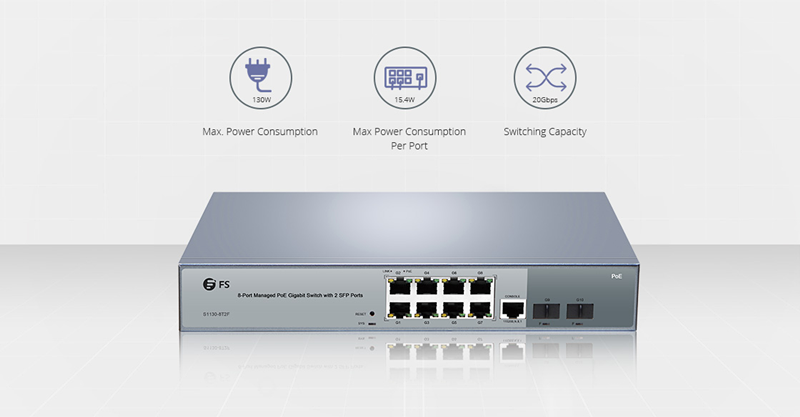 For higher power budget, FS S1250-8T2F 8 port PoE switch can reach up to 250W. Make sure the maximum power supply of the whole switch is more than your IP cameras’ budget, or some of your IP cameras may won’t be provided with enough power. This is also the cause for poor performance and video loss. Unmanaged 8 port PoE switch is a “dumb” plug-and-play one with fixed configuration, which runs in the most basic form with no management functionality. Managed one is an advanced version with superior functionality, configuration customization and remote security control. For heavy-workload networks with management requirement, managed 8 port PoE switch is obviously a future-proof way to go. It is noted that smart partly-managed PoE switch is a choice for functional and cost-efficient concerns. But for IP surveillance, choosing managed 8 port PoE switch is and will continue to be a future-proof solution. There are other factors one may concern about, such as 1U form factor for space budget and stackable one for network expansion. Customized demand may be required for some special occasions. For instance, a fanless design is important for silent operation in libraries, classrooms and laboratories. FS S1130-8T2F 8 port PoE switch can meet the need. The best way is to list all those points you care about, then check each one for the targeted PoE switch. How to Install 8 Port PoE Switch in IP Surveillance System? 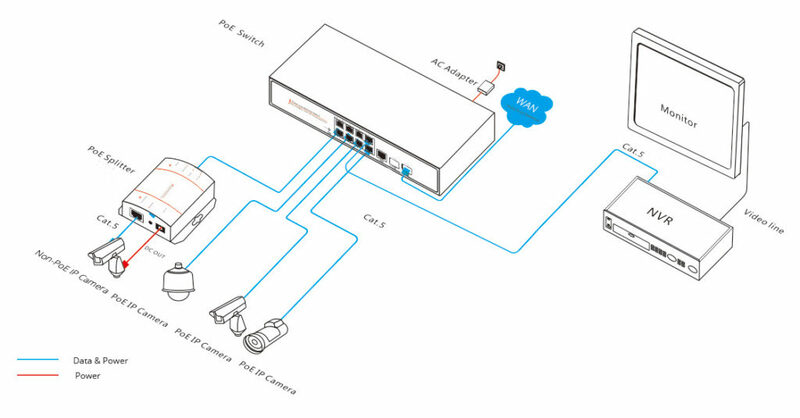 An IP surveillance system comprises PoE switch, IP cameras, NVR and Ethernet cabling. To illustrate how to use PoE switch for IP surveillance, we’ll take FS S1130-8T2F 8 port PoE switch as example. This PoE+ switch has 8 x 10/100/1000Base-T RJ45 Ethernet ports and 2 x gigabit SFP ports, with IEEE 802.3af/at compatible, which means it supports 30W maximum power consumption. To set up an 8 port PoE switch for IP surveillance, you can refer to the following tips. First connect all IP cameras and NVRs with RJ45 ports on PoE switch. Then connect LAN/WAN with SFP ports. It is noted that for non-PoE cameras, a splitter is required as a medium to connect PoE switch with IP camera. The following picture shows the detail information for installation. Figure 2: Installing FS S1130-8T2F 8 port PoE switch for IP Surveillance. PoE switch provides placement flexibility, space and cost saving, and management convenience to IP surveillance system. For buying 8 port PoE switch, one should concern about power consumption of IP cameras and PoE switch, managed one for superior functionality and other customized requirements. Generally an 8 port PoE switch can satisfy a small sized IP surveillance system. For medium and bigger sized systems, FS also provides managed PoE switch with 24 and 48 port. Welcome to visit our official website for more detail information. POE(Power over Ethernet) is ideal for using in smart applications which makes CCTV even more effective and easier to manage. The network can be monitored, controlled, and managed from a smartphone or tablet. With a POE switch such as the Netgear ProSAFE 8 port switch, remote IP surveillance cameras can be controlled and managed no matter where they are located. Facing the selection of 8 port PoE switch, most of people would occur allodoxaphobia. For fixing this hard-decision problem, this article would put emphasis on 8 port PoE switch selection guide and tips. There is a variety of 8 port PoE switches with different brands. Today, we would take FS.COM 8 port switch as an example to introduce 8 port PoE switches. FS.COM S1130-8T2F managed PoE+ switch comes with 8x 10/100/1000Base-T RJ45 Ethernet ports, 1x console port, and 2x gigabit SFP slots. It can supply power to network equipment such as weather-proof IP cameras with windshield wiper and heater, high-performance AP and IP telephone. This managed PoE+ switch are highly flexible, the transmission distance of the SFP fiber port can be up to 120km, and with high resistance to electromagnetic interference. It also features superior performance in stability, environmental adaptability. FS.COM PoE+ Gigabit switch comes with a one-year limited warranty, including any quality problems during the free maintenance. The detailed specification of FS.COM S1130-8T2F managed PoE+ 8 port switch is shown in the below. Review the data sheets of the camera’s you have specified on the installation to see if any have higher power requires known as PoE+. If you have 1 or more camera’s requiring PoE+ power you will need to heavily consider this when choosing your switch. (Please note PoE+ switches will happily power standard PoE devices but a standard PoE switch cannot power any PoE+ device, regardless of the amount of wattage unused by the other connected equipment). However some switches are designed to power both PoE and PoE+ devices, please check the specification sheet of that exact switch model to see if this is possible on your selection. If this is the case you will usually find a the switch will handle half the PoE+ devices it will PoE e.g. An 8 port switch can power 8 standard PoE devices or 4 PoE+ devices. Make sure when planning your network you do not have cable runs longer than 90 meters. This is particularly important when using PoE due to voltage drop. PoE is particularly hard to measure voltage on so if you break the 90 meter cable rule you could be in for a world of pain if devices do not operate correctly. There are many 8 port PoE switches of major brands on the market, such as Cisco, Netgear, HP, TP-Link and etc. The 8 port switch price varies in difference brands. But they all controlled in a certain range, it’s around $40~$300. For brand selection of 8 port PoE switch, that depends on your preference. You can check the price discrepancy with major brands in the following table. Notice: All the following prices except FS.COM are from Amazon. 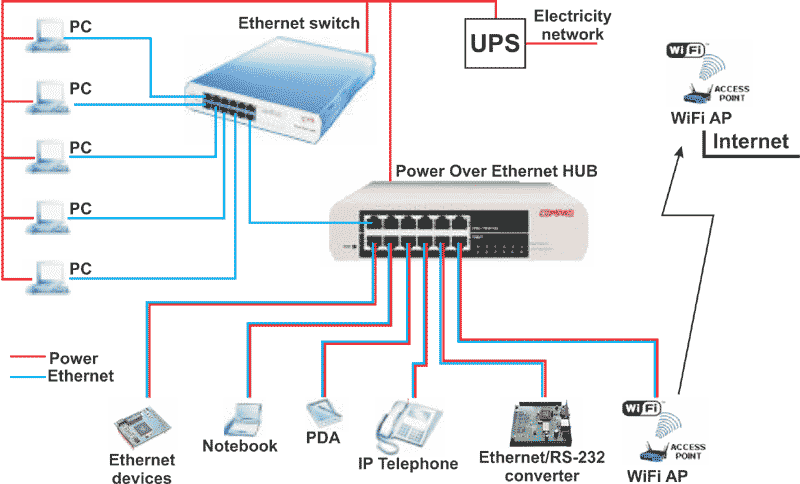 This article mainly introduce FS.COM S1130-8T2F 8 port PoE switch and provide 8 port switch selection guide and tips. How to choose a reliable supplier from so many 8 port switch manufacturers? Before buying 8 port PoE switch, the quality, power requirement, price, cable run length should be considered. As one of well-known 3rd-party optics manufacturers, FS.COM is suggested to be a good choice for 8 port PoE switch.